Last night, in the middle of a face-melting punk show, GG stopped the music to show us what they’ve been working long nights for three years to complete. Over the opening notes of Also Sprach Zarathustra (as featured in 2001: A Space Odyssey), they promised it would revolutionize the industry. An artificial fog rolled in and I remarked that every year someone revolutionizes the industry. Then, as the song reached a crescendo and the bike was hoisted like a young Simba before its aficionados, I wondered if something was wrong with my aluminum bike. This is why I’m reviewing a bike that you can no longer buy. Some have taken short demos of the carbon generation, but the only long-term reviews out there are all for the aluminum models, including this one. If you’re considering a new bike, go read them all, they are still absolutely relevant. The Trail Pistol, Shred Dogg, Smash, and Megatrail are the metal core and the punk soul of Guerrilla Gravity. I believe that a new carbon process won’t change that at all, but it might shake up some other brands. GG’s other announcement, which may have been overlooked, is the amount of customization that their new bikes will allow, possibly because tinkering has always been a staple of their design. It’s certainly what has made my Trail Pistol such a versatile machine--not just regarding terrain, but in terms of my own riding ability. I want to stress this because you wouldn’t guess it from their branding; I first hopped on my Pistol as a cautious intermediate, and it has not just been with me every step as I improve, but actually encouraged and dared me along the way. It made me a much better rider. Phase One, or: How I Learned to Stop Worrying and Love the Bike. 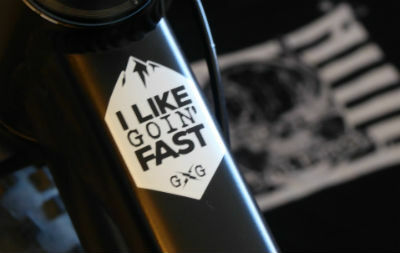 I always thought GG made an awesome bike, but never thought I’d get to own one, or that I’d need to. I’ve been working at bike shops since 2012, but haven’t owned a car to get to trailheads with. Until last year my riding was limited to sporadic group rides or demo days, and never on the same bike, since there was usually one to borrow. That’s how I managed to break a bone at Green Mountain--a tubed tire on a pogo stick fork washed out my front wheel and then I was sidelined for three months. I decided that the next mountain bike I rode would be my own, even if my budget limited me to a hardtail. The following spring I bought a Salsa Timberjack. 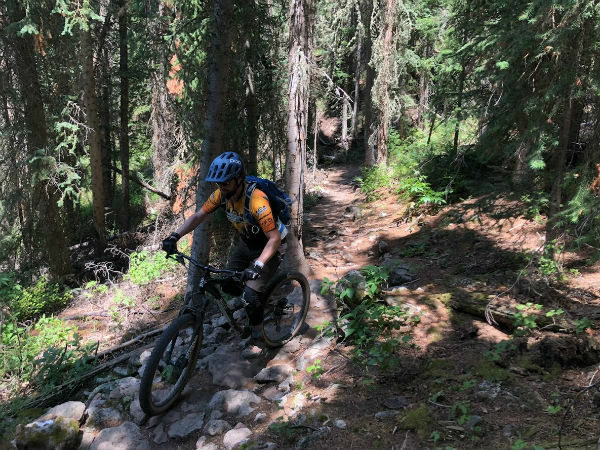 That bike was perfect for the easier-Intermediate trails I was comfortable riding then: North Table, Buffalo Creek, Centennial Cone, and a few trails in Breckenridge. My biggest improvement during this time was switching from clipless to flat pedals; I didn’t automatically dismount for intimidating sections since I knew I could bail easily, and I was surprised by what I could do. I rode the entire Monarch Crest trail on that Timberjack, and I would have shredded that bike for the rest of the season if not for a lucky raffle ticket. On a day that was too hot to ride, Guerrilla Gravity hosted a COMBA fundraiser slash barbeque at the Shredquarters. My introvert brain nearly kept me home, but there was free beer, I live a mile away, and Ian’s band is really good, so I went, and I threw $20 at the fundraiser raffle because you miss 100% of the shots you don’t take. Several shots later I won the top prize, a Pedalhead hardtail frame. That bike is rad, but I had a hardtail already, so I opted to apply the prize as a credit towards a full-suspension bike. The Trail Pistol was only one model that would let me transfer over all of my parts including the fork. To match said fork (and the included T-shirt) I chose black powder coat with white decals. I kept the plus tires from the hardtail because that traction really does inspire confidence, especially now that I was fully-squished. It was perfect. That confidence led me to trails that had always eluded me, on the edge of intermediate and advanced. In Colorado, this means more chunk, which means traction becomes less important than approach angle for not getting tossed around by big rocks. This meant it was time for 29er wheels. I picked up some DT Swiss M1900s and fitted them with the DHF/Aggressor combo. (So hot right now.) I switched the rear linkage into “Crush” mode. At the time, the Crush/Plush chip was only seen on the Trail Pistol, and GG’s website described “Plush” as a way to raise the bottom bracket height for 27.5 plus tires. Almost immediately I felt better on easier climbs and flat rock gardens, but had mixed success on technical, rocky climbs, and I felt less confident descending. I wanted to blame the skinnier tires, but then I looked into what that little chip actually does. My understanding of kinematics is pretty limited, but smarter people have told me that the ‘17/18 Pistol’s Crush mode slightly slackens the bike, lowers the bottom bracket, and gives the leverage ratio a more progressive curve. This is great news if you’re rallying corners and stomping doubles, but not if you’re flailing up and down trails at the edge of your ability level, so I switched back to plush. With my front end easier to control and my pedals just a tad higher, plus the rollover of 29er wheels, I made it up climbs that had defeated me on every other bike. 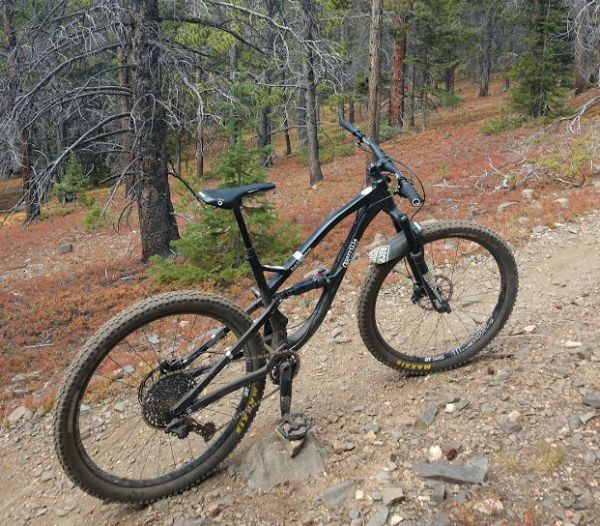 With a more active and supple rear suspension I found it easier to maintain traction on comparatively-skinny tires, and was less fatigued by long descents. I confirmed this with a trip to Moab. I told GG that the Pistol is perfect for me in 29er/Plush mode, and they said I’m not the only one to provide that feedback. It seems the new carbon front triangle will make the Crush/Plush chip available on all of their models, and that’s a very good thing. It takes a lineup of bikes that will do just about anything and makes them instantly more accessible without taking anything away from the expert rider. Similarly, I started with less travel and was able to add some (more on that below), but I’m now at the practical limit of the frame. Progressing riders on the 2019 models will be able to make the same bike bigger and badder until they reach Mach Stupid, That’s awesome. 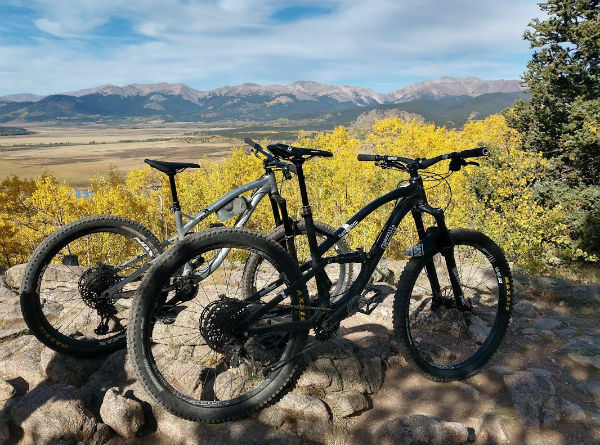 GG seems more focused on the possibility of a park-ready bike that can be converted for a long trail day, and that makes sense, because it’s who they are. I have not ridden either of the longer-travel models, the MegaTrail and Smash, but two of my riding buddies do, both of whom will drop me on a descent. The only time I’ve ever heard them complain was on long trail days with unrelenting climbs. In contrast, I rarely felt like I wanted a bigger bike until we rode the Whole Enchilada, a trail full of drops begging to be hucked. The hits get rowdier the lower you go, and so did I. 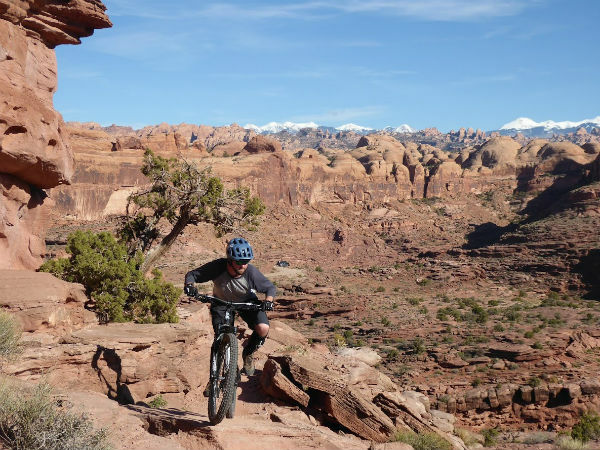 With this new tool in my belt, I became a much better rider in a short time, but another Moab trail still stifled me and became my white whale. I must not be the only one, because it’s called Captain Ahab. For the rest of the trip I rode really well, but also thought how nice it would be to get a little more travel. I got to tinkering. I confirmed with Bobby that an extra 5mm stroke would produce 10mm more rear travel without creating tire clearance problems, and ordered a Cane Creek DB Air. This had the added benefit of giving me a more effective climb switch. I also swapped my fork’s air shaft (and performed an overdue lowers service) to take the front travel from 130 to 140. I started doing laps on Dakota Ridge, walking less and riding more each time. 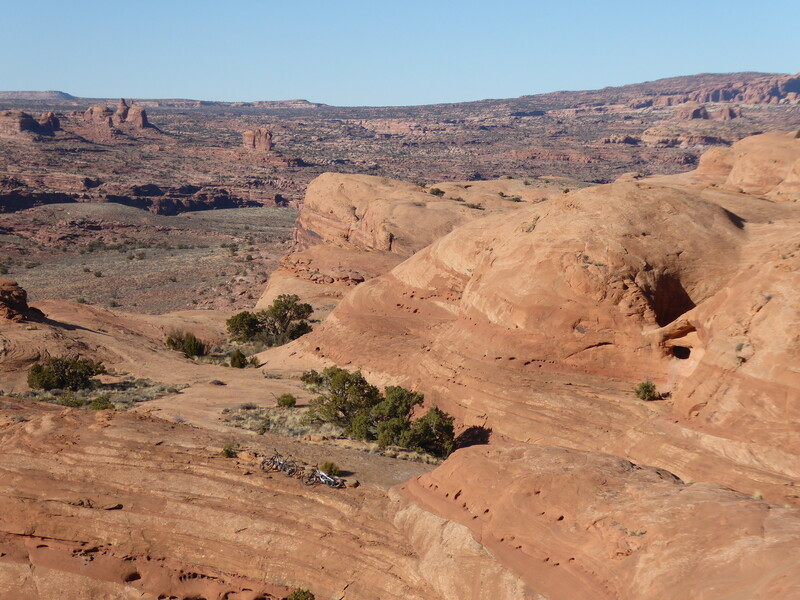 Then we went back to Moab and I sent all but the two spiciest sections of Captain Ahab, and the bike was perfect. Sure, the drive ring in my rear hub stripped out of its shell and I had to coast and walk two miles back to the car, but these things happen. I made it from July to November riding at least weekly and crashing at least monthly without breaking my bike or anything on it. That’s amazing. Poison Spider had a wheel in stock and an open stand outside for me to do the swap in. Jubel offered to help me with my warranty if DT Swiss gave me any trouble. They didn’t. I had a new wheel in a matter of days, but I was already thirsting for hubs with better engagement, and now I had an excuse, so I sprung for some i9 hubs and Nox rims. So I added a click to fork and shock, then I added another, and then it felt like a new bike in the good way. 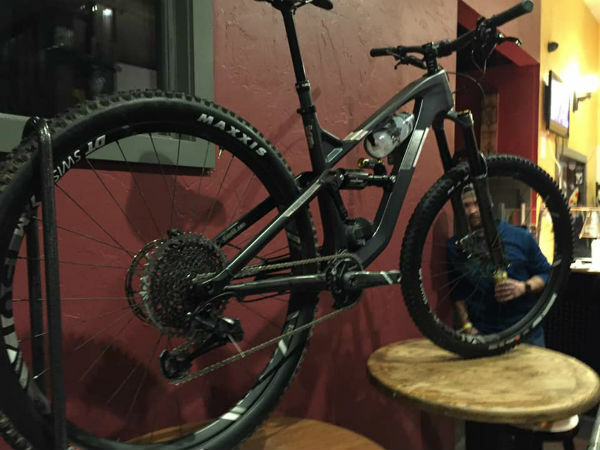 Carbon wheels are stiff, much stiffer than aluminum, and every little thing on the bike affects everything else; nobody knows that better than the people like Ian who built and assembled that bike. With the help of that kind of passion and expertise, which is in great abundance at Guerrilla Gravity, I’ve gone from dismounting at the first obstacle to thoroughly enjoying the challenge of a technical climb. I’m still a cautious descender by GG standards, but I enjoy a moderate bomb down the chunder and chunk, and I’m still working on committing to faster, steeper lines. If and when I finally pin it, I know my Trail Pistol will still be right there with me--it says so on the top tube. This if my Trail Pistol. There are many like it, but this one is mine. My Trail Pistol is my best friend. It is my life. I must master it as I must master my life. Without me, my Trail Pistol is useless. Without my Trail Pistol I am useless. I must ride my Trail Pistol true.